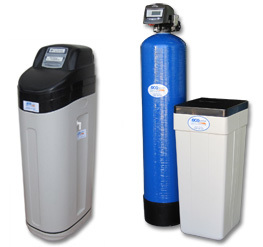 Residential water softeners remove the "water hardness" (calcium and magnesium minerals) from the water through an ion exchange process. Hard water causes excessive use of detergents and soaps, bathtub rings, discolouring of glassware and dishes, and scale deposits on pipes and plumbing. Hard water is hard on your body. It is harsh on your skin and hair. It dulls colours and makes clothes feel coarse and stiff. It can shorten the life of your dishwasher and hot water service. Scale build-up from calcium in your hot water system also increases the costs of water heating. The benefits come in many forms - longer life from appliances, lower heating costs, more efficient use of detergents, healthier skin, quality of drinking water and longer life from machine components due to non-scaling. Digital water meter continuously calculates water usage, and automatically regenerates only when demand requires. The economical twin tank style (free standing fibreglass resin cylinder design, with separate high density, ultraviolet-stabilised cabinet incorporating 50kg salt storage tank). Suitable for households up to 6 persons. Need help choosing the right softener? See our product range and technical information here. If you need more help, please contact our Customer Service Team on 1300 166 253.